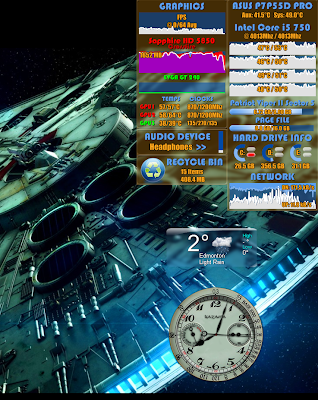 Rainmeter. It's an amazing tool. "What is Rainmeter?" I hear you ask. It is, basically, a gadget. Much like you can get on your Windows desktop, showing you all sorts of useful information. But it's not just a gadget. It's an overlay. You can completely customize it to do almost anything you want - actually, with enough knowledge, you can probably get it to do anything. The image you see here is my Rainmeter. I completely created this from scratch (that is, the monitoring stuff is mine). There are actually 4 windows there, there's a large one on the right with all my CPU, HDD, RAM, and network info. On the left of that there's one with all my GPU info - temps, clocks, framerate, usage. Under that is one that lets me choose which audio device I want to use. Currently it's on headphones, and by clicking on the ">>" I can select speakers, or whatever else I have plugged in. Under that is the recycle bin, and with that I can not just see how much is in there, but a left click will open the recycle bin while a right click will empty it. Underneath my skins, as the windows are typically called, are two skins I downloaded. One is a weather app, the other one a nice clock. Making your own skins is actually fairly straight forward, and there is a good tutorial on the Rainmeter website. However, there's also a huge amount of already generated skins for you to find and download. Some are simple, some are complete desktop overhauls. See Deviant Art for a great selection of skins, and to give you a good idea of how powerful this tool can be.